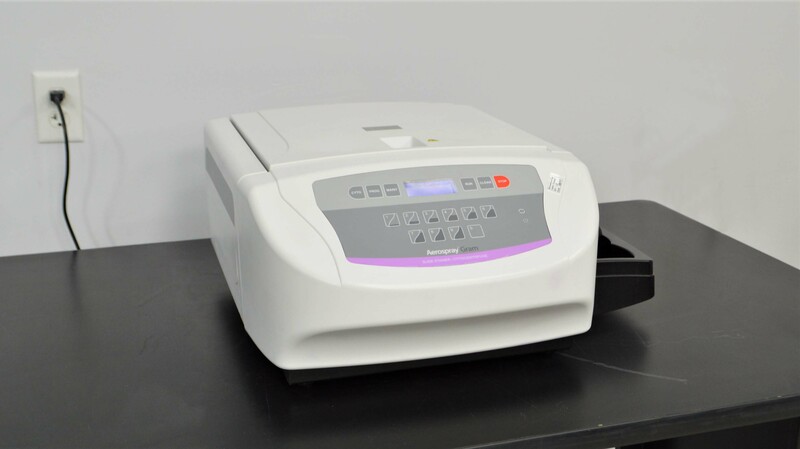 Wescor Aerospray Gram Slide Stainer CytoCentrifuge 7321 Pathology Histology . New Life Scientific, Inc.
90-Day Warranty. Tested and Working. This Wescor Aerospray Gram Slide Stainer is in great cosmetic condition with minor residue from previous use. The lid and hoses on the right side of the instrument are original and serve the staining/reagent tray. The plastic rotor was replaced in April 2018. Stainer is in great physical condition. Does not come with drain connector and line (waste tubing). This instrument is warranted to be functional and is protected by our 90-day warranty. Our in-house technician thoroughly cleaned the jets in a sonifier, flushed the lines, and reviewed the physical condition of the Aerospray Stainer. The technicians confirmed there are no clogs, and all motors and buttons were evaluated to work correctly. Rotor was replaced in April 2018. Prior to storage, the technician flushed the lines with alcohol, then water, to prevent dry seals.